Fall is here and a whole new batch of films is about to invade our multiplex. This breed is far different than the cape and tights of the Summer months, and if Contagion is going to set the tone for the rest of Fall, I am quite ok with laying the blockbusters to rest for a few months. 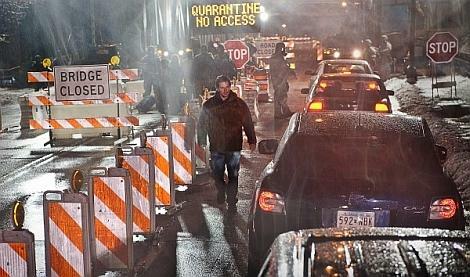 In my Fall Preview, Contagion was the number one film I was looking forward to this season and I am happy to say it is a resounding success. This is exactly how I wanted to started off Fall and am excited for what the other nine films will bring. 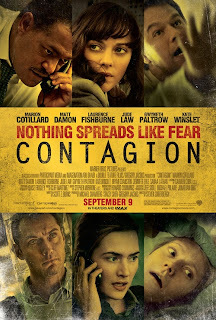 Contagion is the latest from Soderbergh and Burns, who collaborated previously on the criminally underrated The Informant. 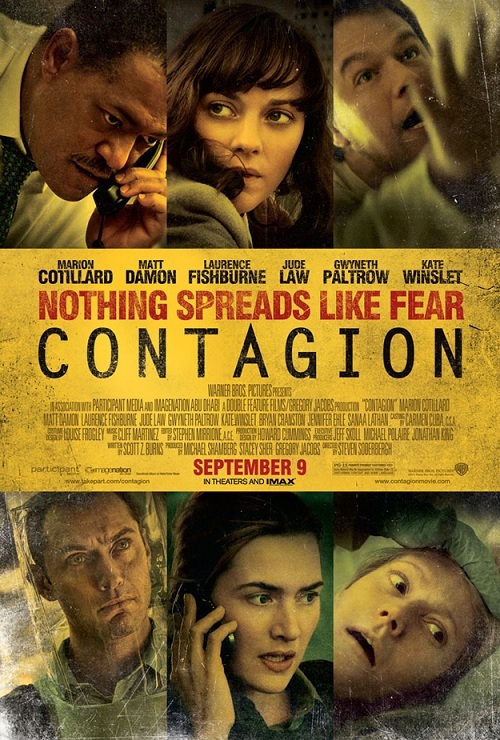 This is a film about a disease epidemic and charts the course of the disease over 150 days or so. This story is told from multiple perspectives ranging from the everyman played by Matt Damon, to various operations within the CDC, to the media represented here by Jude Law in conspiracy theory blogger mode, to the global scale represented by Cotillard working for WHO trying to track the origin of the disease. Soderbergh never plays anything for spectacle, he shows us horrible images and characters spout out terrifying statistics, but it is played real and we feel like this is how it would play out if this pandemic occurred. 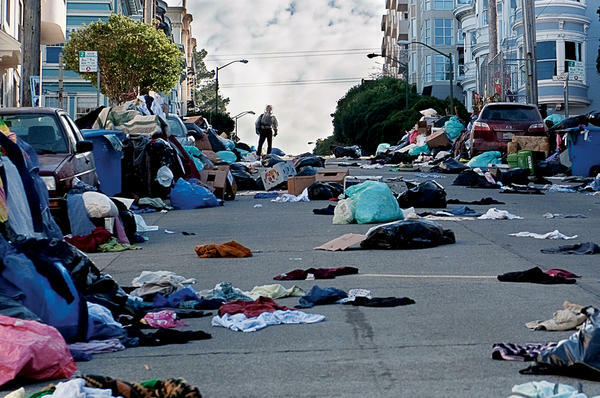 To the point where we see small details like trash never being picked up, to constant discussion in the background of public servants refusing to go to work for fear of the virus. Burns never dumbs down the script for anyone, forcing the audience to keep up with all the medical jargon and the amazing pace with which the film progresses. As we chart the progression of the virus, so do we chart the evolution(or decline) of civilization in the face of such crisis. Just like the virus spreads exponentially, so does the chaos within society. We go from crowded supermarkets and pharmacies to full on mayhem as looters roam the streets, and people murder each other for rations, we even see a kidnapping as an attempt to ransom out the supposed vaccine. Soderbergh is not playing everything for gloom and doom, as we continue to move forward past the looting and desperation he shows that ultimately humanity when faced with rock bottom will band together. 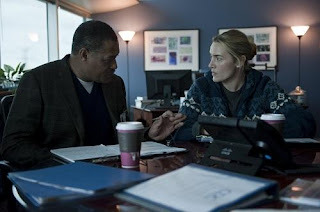 A lab technician makes the biggest risk of her life, Matt Damon works his hardest to preserve normalcy for his daughter( a scene which I loved, that could've fallen flat in the hands of a lesser director), Laurence Fishburne gives back to the common man, even the kidnappee sees the reality of the situation and tries to help her would be kidnappers. That's where this film really excels, in its honest and hopeful depiction of humanity. Every character makes believable real life decisions, some of them are not the right ones and absolutely no one is perfect. It doesn't hurt that Soderbergh has this film packed with an amazing cast, down to the smallest role. John Hawkes has a tiny but heartfelt role as the blue collar worker with no hope of being the lucky few who might get a vaccine. Fishburne has a moment of weakness, like we all would and ensures the protection of his family. Law is the only person in the film interested in causing a panic. He is the blogger in search of the truth, as well as some cash on the side. He is both the representation of opportunist, and counter point to the whole movie, because even in the end we still never know if he was right. I couldn't possibly get into every part into this film in detail, but it would be a shame if I didn't mention Kate Winslet as the CDC representative sent to Minnesota to investigate what is thought to be patient zero. She plays her role perfectly, up to her last scene which again is subtle, when it could've been played with bombastic music and close ups. It's funny that Soderbergh did some second unit work on The Hunger Games, since here his second unit work is so important to the story. Soderbergh highlights every touch, every sip, every gesture, and lingers on otherwise meaningless shots reinforcing the gravity of the smallest action. Like everything else in this movie he juxtaposes big world ideas with intimate moments and highlights the relationship between the two. So whereas a forgetful night at the casino seems meaningless, leaving that credit card behind just infected a handful of people. I could go on and on, but I urge you all to check this film out for yourself. A great way to start off Fall and has me really excited for the rest of the year. Soderbergh continues to impress as a director able to work within the indie scene and mainstream Hollywood. One last thought - I didn't even mention the score, an amazing blend of orchestra and electronic undertones that lends itself perfectly to this modern disease "thriller"
Fall Network TV: Are these dreams a reality? All Content, Logos and Opinions are Copyright of PORTEmaus... Filch them at your own peril. Cheers. Simple theme. Powered by Blogger.